Some industry insiders are starting to wonder whether unicorns will hold their sky-high valuations — currently a combined $1.08 trillion — or crash to earth, bringing investor returns with them. The questions come at a time when a number of these companies — startups valued at $1 billion or more — have signaled their intention to go public in 2019, racing to offer their venture capital backers a return should public market volatility ramp up more. "Valuations have gotten extraordinarily high and people are wondering how long the great run is going to last," said Heidi Mayon, Redwood City, Calif.-based partner in the technology and life sciences group of law firm Goodwin Procter LLP. Expected investor returns are based on valuations until an exit, and those valuations are based on successive rounds of financing, said Steven N. Kaplan, the Neubauer Family distinguished service professor of entrepreneurship and finance at the University of Chicago. "Before companies are sold or have an IPO, it's a mark," a point-in-time valuation of the company, "and I don't know if the marks will come in or not," Mr. Kaplan said. While a tiny sliver of institutional investors' portfolios, venture capital investments can sometimes deliver handsome returns. According to a 2017 report from Preqin, the most recent, venture capital funds — vintages 2007 through 2014 — with unicorn portfolio companies delivered a net internal rate of return of 18% compared to 13% IRR for all other venture capital funds. Unicorns have become a force to be reckoned with in managers' portfolios. 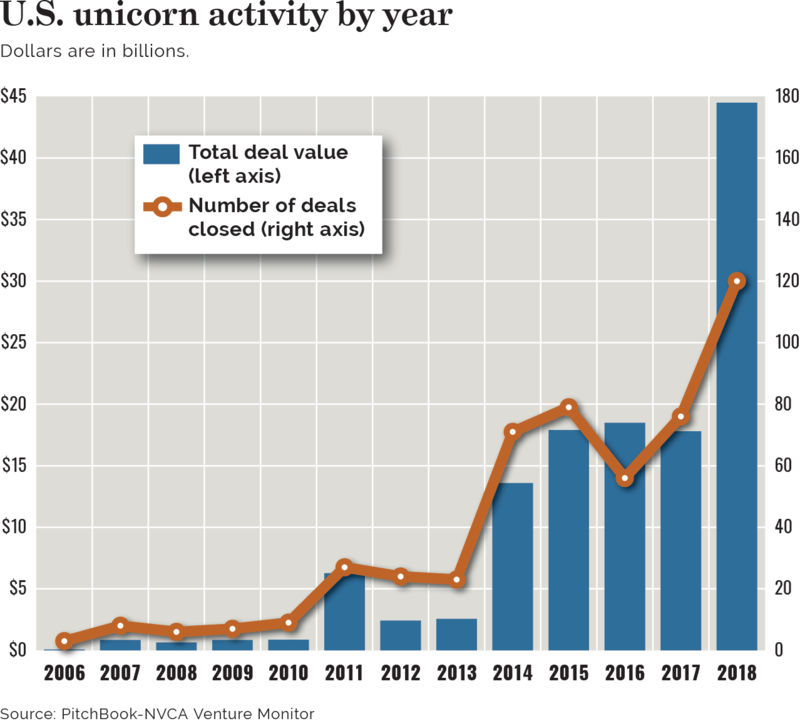 In 2018, unicorns raised a combined $44.5 billion, accounting for 33.9% of total investments by venture capital firms, according to the fourth-quarter 2018 PitchBook-NVCA Venture Monitor. But unicorns aren't exclusive to venture capital funds, appearing in the portfolios of private equity firms such as Technology Crossover Ventures, multiasset-class alternative specialists including KKR & Co., middle-market buyout-growth equity fund TPG Growth and traditional money managers such as T. Rowe Price Group Inc., Fidelity Investments, BlackRock (BLK) Inc. (BLK) and Goldman Sachs & Co, according to a list by data platform CB Insights. Graham McDonald, Edinburgh-based head of private equity at Aberdeen Standard Investments, said he, too, is not sure if the unicorn story will end well. "I get nervous when I see (unicorn) valuations," he said. "Where does it sit with the wall of capital chasing venture capital and other companies staying private longer?" He said he wonders if venture capital dry powder is keeping unicorn valuations high. "There will be some kind of correction at the top end," he said. "We are living in a world where we see more IPOs with negative EBITDA (earnings before interest, tax, depreciation and amortization) in history." Aberdeen executives are "watching with interest" whether negative EBITDA can be reversed, he said. Unicorn investments will "end very poorly for many ... there are flowers in the garden but a lot of weeds, too," said Steve Rosen, Cleveland-based CEO of private equity firm Resilience Capital Partners. Some unicorns that had initial public offerings failed to hold their valuations after the sale, he said. For example, Snap Inc., closed on Jan. 16 at $5.64 a share, a 67% drop from its $17 per share IPO price in 2017. In two years, Snap's valuation has plummeted to about $8 billion from roughly $20 billion pre-IPO. If that happens with this year's string of unicorn IPOs, investors could lose confidence and make it more difficult for venture capital, private equity and other unicorn backers to exit through the public markets, Mr. Rosen said. "When the venture capital community begins underperforming every benchmark because there are no exits and they are not returning cash to investors," the asset class could drift out of favor with investors, he said. "The biggest issue for unicorns is whether their valuations make sense," Mr. Rosen said. To some degree, valuations are based on what the future holds more than traditional valuation metrics, he added: "When the unicorns go public to provide their private equity and venture capital firms and their investors a return, will the public market valuations be correct, or is there a risk of a fund correction at some stage?" The issue is that certain companies were ascribed high valuations, achieving unicorn status ahead of their operational progress. Their ultimate valuations are important to investors because the performance of a single unicorn can affect the returns of the entire fund, said Kirsten Morin, Stamford, Conn.-based co-head of venture capital at Aberdeen Standard Investments. "Returns have always been highly concentrated in venture and it has become even more prevalent today," she said. "A single company can drive returns for a vintage year." Eventually, all of the unicorns that haven't been acquired "will have to go public, driven by a need to create liquidity for their investors and tap into the more diverse sources of funding available in public markets," said Yann Ranchere, Geneva, Switzerland-based partner at venture capital firm Anthemis Group SA. Goodwin Procter's Ms. Mayon said that while unicorn valuations are high, she does not think valuations have lost touch with reality, as they did in the dot-com era of 1999-2000. The gap between the company's real valuation and what the company was receiving in an IPO was much wider in the dot-com era than today, she said. During the dot-com bubble years, companies did not have to provide user data in a way that was tangible and measurable, she added. These days, companies have to provide revenue and user data, she said. While some of today's unicorns are profitable, it is not required, depending on other financial metrics used by venture capital investors to measure the progressive success of the company, Ms. Mayon explained. Keith Townsend, Atlanta-based partner and head of capital markets at law firm King & Spalding LLP, said today's unicorns are in better shape to go public because they were able to stay private longer than dot-com companies, allowing some to create the systems and add the staff and departments needed to face public markets at the right time. Without the private capital, some would have been forced to access the public markets earlier, he said. Now more unicorns are heading for the exits, also motivated by company maturity and the need to provide liquidity to employees, Aberdeen's Ms. Morin said. Some of the ''brave few" unicorns that already have taken the plunge, such as Dropbox Inc., have performed well, setting the tone for IPOs in 2019, she said. Dropbox, which went public in March with an IPO price of $21 a share, closed at $22.60 a share on Jan. 17, a 7.6% gain.